5th year Mentors organised a 1st year activity event in the PE Hall on 11 March. This was to celebrate the positive participation of all 1st years in the Step Challenge which was run by the Manor House Health Promoting Committee. Since the beginning of the year 1st years and other students have been embracing the challenge of being physically active during their school day. The 1st years have been especially enthusiastic and one student, Emma Brown, was rewarded for achieving the greatest number of steps in the challenge. Well done Emma and well done Ms Johnston who leads the Health Promoting Committee in our school. A huge thank you to Ms Gaughan and the 5th year Mentors who planned the event for the 1st years! 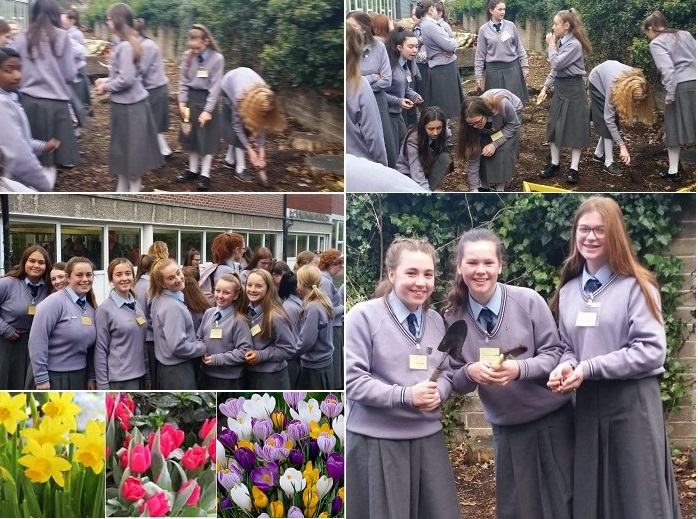 The 1st years and their 5th year mentors continued the annual bulb planting tradition in Manor House by planting daffodils, tulips and crocuses. The area outside the cafeteria will look lovely in the Spring. Thanks to Ms Gaughan and the Wellbeing Team who organised this year's event. They are looking forward to a beautiful display of flowers in a few months time. We welcomed our incoming 1st years to Manor House School on 12 May and during the morning they all visited the Science Department on the top floor. After a tour of the five Science labs, the students carried out a heart dissection, guided by Ms Tracey. Well done to her four volunteers - Aisling Brassil, Jasmine Paget-O’Donoghue (Scoil Aine), Aoibheann Bisset (St.Bridgets) and Aiveen Bullock (St.Benedicts). Definitely the scientists of the future! 5th year Mentors organised a table quiz for 1st years on 7 April 2017.